Excellent place, amazing staff, breath taking view - all you can possibly need!! 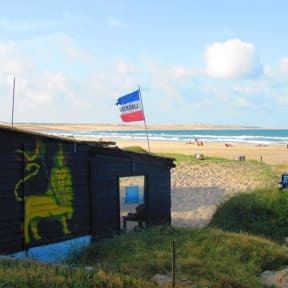 I had a great stay at Cabo Polonio Hostel. It is next to the beach. Warmly welcomed by the stuff. Very well organized with ecological background. Loved staying in Cabo Polonio Hostel, it had everything I needed to enjoy a couple of days in this amazing place. 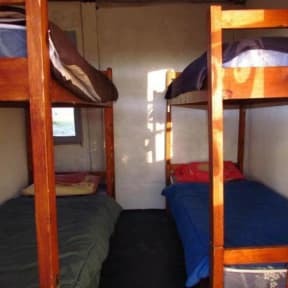 The hostel was clean, had hot showers, well equipped kitchen, you can charge your electronic devices during the day. It was so nice to relax on the porch and I could see the ocean waves shining with noctilucas even from my bed before falling asleep. Met some wonderful people there. Staff was helpful and the dog with many names that lives in hostel is lovely and very clever. If you're after a really rustic hostel experience this is a great choice. It's pretty basic but it's right down on the beach; so close in fact that you can watch dolphins swimming in the sea while you eat breakfast. General not very clean. Little space in the 4 bed mixed dorm. Indoor common areas are sort of appropriated by staff, so there is only limited common area available for guests when it rains. Cabo is special! However extremely over priced for the standard - when you stay in a beach shack you shouldn't have to pay the equivalent of a b&b!